Residents of the historically African-American neighborhood of Harlem wait in line to vote on Election Day. Washington (CNN) – A new Census Bureau report shows a higher percentage of African-Americans than whites voted in a presidential election for the first time in history last year during the matchup between President Obama and GOP nominee Mitt Romney. The report, released Wednesday, found that more than 66% of eligible blacks voted in the presidential contest. Only 64.1% of whites turned out to vote. 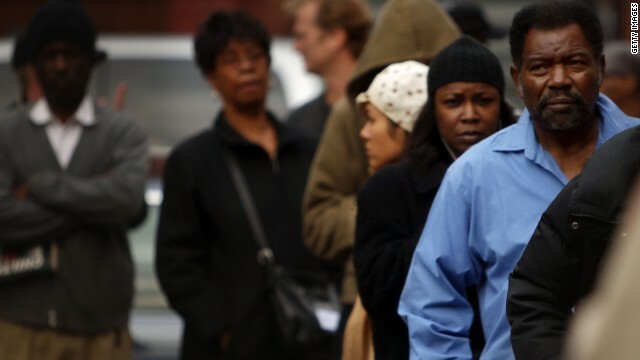 This marks the first time since 1968 that blacks turned out at a higher rate the whites. In addition to blacks turning out at a higher rate, the number of Asian and Hispanic voters grew from 2008 to 2012. Hispanics added 1.4 million people and Asians added over 500,000. Between 1996 and 2012, blacks, Asians and Hispanics all saw their percentage of the voting population increase. We're becoming a minority in the US and Europe. If current trends continue we will fade out of existence. It's called genocide. Does the % include those multipletimes voters or dead black American voters....your democrats so I'm assuming it does. 11% of the country outvoted 55%...I don't think the whites wanted to vote for romney the rino liberal anymore than wanted to vote for communist obama. Luckily I'm native and not really concerned with what color your tyranical dictator is.